Editor's Note: Part Two includes a free download! The authorized strength of an airborne division was about 13,000 men, about 1,000 less than the standard infantry division. The initial plan was to include one parachute regiment, two glider regiments, an artillery brigade, engineer battalion, antiaircraft battalion, and some support companies. All that is well on paper. Logistical realities are a completely different matter. The first airborne division, the 82nd “All American”, was sent to North Africa with two parachute regiments, but only one glider regiment, and the glider regiment did not have enough gliders. There would not be enough until D-Day. Command staff was another problem. Airborne troops were viewed as kind of weird in the American hierarchy. Many senior commanders simply did not want to be in charge of such an aberration of nature. As a result, James Gavin became the youngest Major General in the army and was placed in command of the 82nd Airborne Division. The lack of higher command staff may have helped make the 101st “Screaming Eagles” Airborne Division the first pentagonal division in the modern U.S. Army, with three parachute and two glider regiments. 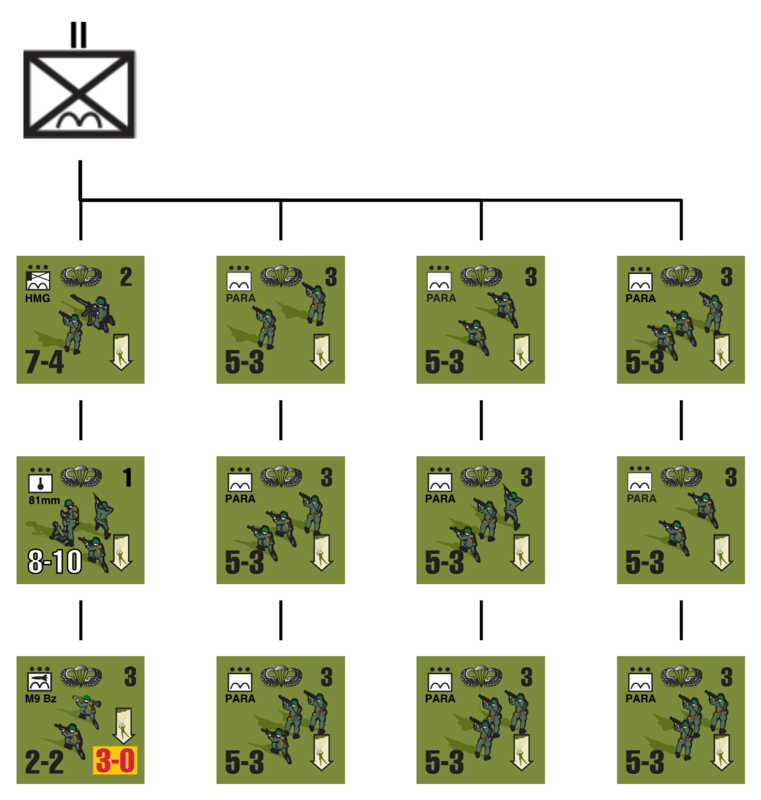 The divisional structure began to settle down after D-Day. An airborne division contained two types of infantry, parachute and glider. The parachute infantry got the glory, while the glider troops were generally looked down upon. This article pertains more to their real differences however. 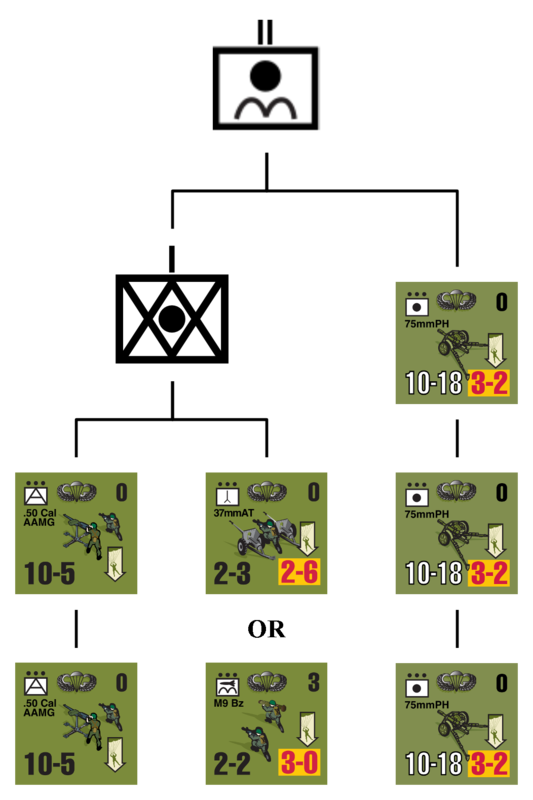 Parachute infantry were organized in platoons of two squads. Their armament was lighter than most American infantry, but with a higher proportion of automatic weapons. As a unit they are similar to the grenadiers who they often fight in the game system. This is reflected quite well in how the parachute units take step losses. Glider infantry are motorized infantry units, with wings. They have three squads, heavier armament, but a lower ratio of automatic weaponry. Both battalions have the same amount of infantry, but the glider battalion has more and somewhat heavier machine-guns. Artillery Brigade: Artillery is a particular problem for an air assault formation. The weapon decided upon was the M3 75mm pack howitzer. The weapon could be broken into several loads, the largest being a little over 200 pounds. The split-rail carriage made it fairly easy to drag around. Nominally a division included one parachute artillery battalion and two glider artillery battalions. Again, that is on paper; the 101st Airborne dropped with three parachute artillery battalions and only one glider artillery battalion. The 82nd took two battalions of each type to Normandy. Paratroop artillerists also took hand carts to move component pieces of the gun when other transport was unavailable. Gliders could carry jeeps, so transport was less of a problem there. Using the Waco CG-4 gliders did require a jeeps and guns to be carried in separate craft; in larger gliders they could stay together. The gliders also carried more ammunition. The parachute artillery battalion had another quirk, the AA/AT company. Need for such airdroppable support was especially important early in U.S. airborne operations. Since it was not a particularly large unit, it was attached to the artillery. There is one AT battery and two AA batteries. Antiaircraft Battalion: The battalion is a hybrid unit containing both glider-borne and air-droppable components. The U.S. version of the 40mm Bofors antiaircraft gun was every bit as much of a problem as the 75mm pack howitzer. Even more so when one considers that it cannot really be taken apart in the field. 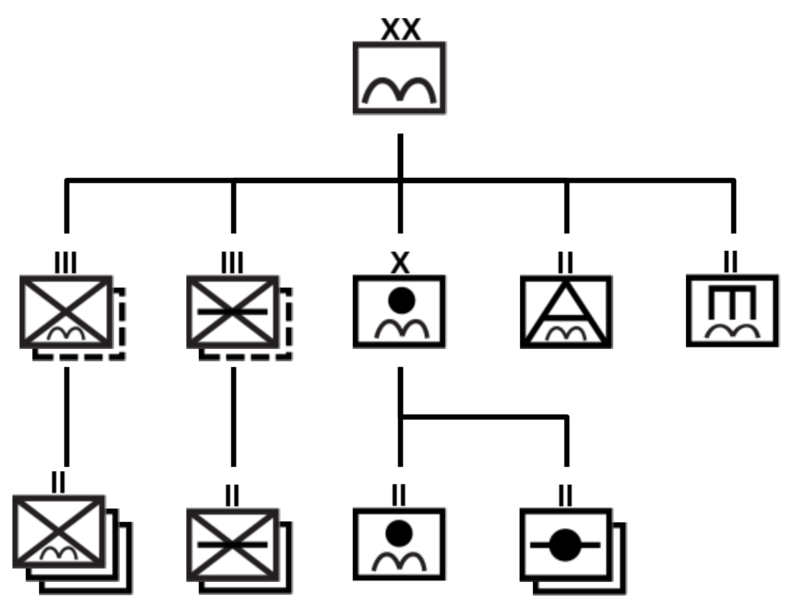 So despite appearing as a parachute unit in the organization diagram, it is really a combined unit. There are three companies each of two 40mm AA gun batteries, and three companies each of three AAMG platoons. The 40mm guns were not air-droppable and had to be delivered by glider, along with their jeeps. The AAMG’s might also arrive by glider, in which case they could also arrive with their jeeps. Engineers: The battalion is a basic U.S. triangular battalion with three companies. One company is parachute, the other two are glider-borne. After that it becomes more peculiar. The parachute engineer company has three platoons. The glider engineer companies have only two platoons.